There are two rail companies that operate trains from Cusco to Machu Picchu Station in Aguas Calientes. They are PeruRail and Inca Rail. A third company, Machu Picchu Train, merged with Inca Rail in 2013. The two remaining companies offer various options in terms of price, departure points, and scheduling. PeruRail has a number of departure points—Cusco, Urubamba, and Ollantaytambo—that can take you to the Machu Picchu station in Aguas Calientes. Aguas Calientes is also known as Machu Picchu Pueblo. PeruRail offers three train classes for touring guests traveling along the Machu Picchu route (a fourth class exists, but it is a subsidized option for Peruvian residents only). 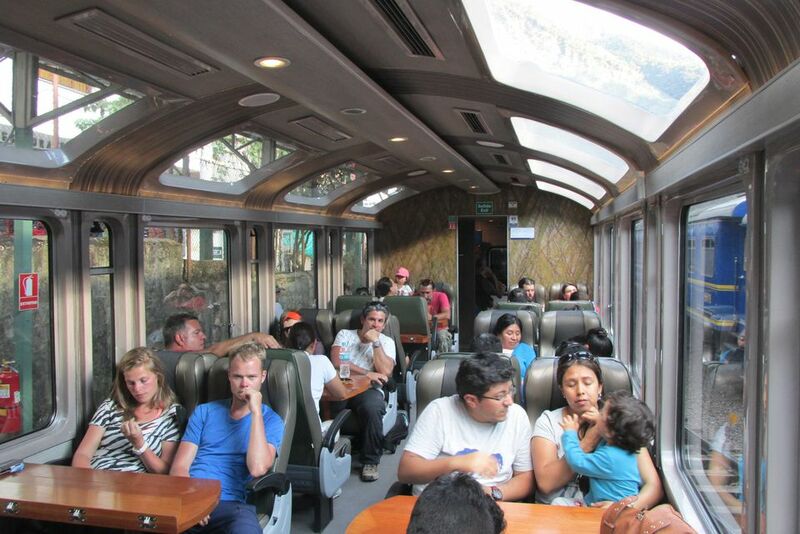 The expedition class is PeruRail’s budget option. It is a comfortable train and a perfectly reasonable option if you just want to get to Machu Picchu. There is not a great difference between the Expedition and the slightly more expensive Vistadome. The cost averages about $65 one way. The Vistadome offers a significantly cheaper alternative to the luxury Hiram Bingham. This is PeruRail’s midrange option. it is comfortable, air-conditioned, and fitted with panoramic windows. The cost is about $100 one way. The Hiram Bingham train, named in honor of the man who rediscovered Machu Picchu, is PeruRail’s luxury option. Expect to pay a little over $400 for a one-way trip from Poroy to Machu Picchu. Inca Rail runs from Ollantaytambo to Machu Picchu Station in Aguas Calientes (some Urubamba departures are available depending on train class). Inca Rail has several classes: Machu Picchu train class; executive class; first-class; and the presidential service. The Machu Picchu panoramic train has wide and tall windows, comfortable seats, an observation outdoor carriage to admire the amazing landscape, a refreshing selection of cold and hot drinks prepared with Andean fruits, and an onboard meal. The cost is approximately $75 per person, one way. First class features plush seats facing tables, including a welcome cocktail, gourmet lunch or dinner, soothing, live background music; fresh flowers, handmade tapestries, fresh fruit juices, herbal and fruit teas. Includes private bus from Machu Picchu Pueblo to the Incan Citadel. The cost is approximately $200 per person, one way. In executive class, you can expect a refreshing selection of cold and hot drinks, including Andean fruits, complimentary snacks, and soothing Andean instrumental music. Costs are upwards of $60 per person, one way. Bookings need to be made in advance for the presidential service; prices vary depending upon exact schedules. An entire carriage is exclusively reserved for you and eight traveling companions. Includes a welcome bottle of champagne and a three-course tasting menu accompanied by fine wines from the region, as well as a stocked open bar. The carriage boasts impeccable attention to detail that evokes the colors and flavors of Andean culture. This service can cost upwards of $5,000 for the entire car, one way (up to eight people). When comparing the two high-end options of getting to Machu Picchu by rail, the two options are the Hiram Bingham on PeruRail and the Presidential service from Inca Rail. The Presidential service is not a different train, but rather a special car on the regular Inca Rail train to and from Ollantaytambo-Machu Picchu. The coach is pleasantly decorated, elegant, and cozy with wooden panels, colorful tapestries, and Andean artworks. There are four dining tables, a living area with an L-shaped leather sofa, a well-stocked bar, a private bathroom, plus a balcony to enjoy the breezes as the train rolls through the Sacred Valley. The journey is only 1.5 hours. In that time, you can enjoy a 3-course meal, paired with wines, and you will not feel rushed through the experience. Comparatively, the Hiram Bingham is decorated like a 1920s Pullman carriage with polished wood and brass finishes. You can expect a welcome show aboard the train with typical dances and music of the region. The carriage includes a bar car, gourmet lunch, observatory car, and entrance to the VIP lounge at Machu Picchu station and a tour guide for up to 14 people and tea time at the Belmond Sanctuary Lodge Hotel in Machu Picchu. Depending on where you board, the ride can be from 1.5 to 3 hours long.